Egg Harbor City, New Jersey, U.S.A. Welcome Doug Dickinson, member of the City Council, and all the wonderful people of Egg Harbor City who are keeping the legacy of the Peace Pilgrim alive with gardens, events, and a growing vision and mission for instilling a culture of peace for the birthplace of this American peace hero. 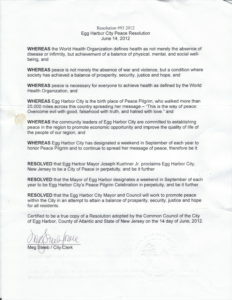 EGG HARBOR CITY – A culture of peace should be a way of life in the city that produced Peace Pilgrim, one of the world’s greatest peace activists. The City Council on June 14 signed a letter of intent and passed a resolution supporting the community’s efforts to become part of the International Cities of Peace network. According to Barbara Reynolds, who was instrumental in educating local residents about the Egg Harbor City woman who walked the nation’s highways and byways from 1953 to 1981 in the name of peace, the city is way ahead of other cities around the world seeking the designation. Reynolds is on the board of the international Friends of Peace Pilgrim, a non-profit organization that distributes Peace Pilgrim’s books and pamphlets free of charge to people around the world. 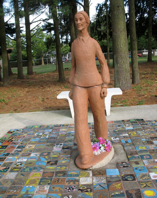 “Egg Harbor City has really been a city of peace for more than 10 years, since it recognized Peace Pilgrim and her simple but profound message of peace, commissioned a statue of her, dedicated a park in her name, and made peace a part of the curriculum for students in the public schools. We also have hosted a three-day celebration of peace for each of the last four years,” she said. Reynolds explained that the United Nations defines a culture of peace as one that rejects violence, uses dialog to solve conflicts and promotes equality, understanding and solidarity for its people. “Egg Harbor City is ahead of the game because it does so much already,” she said. Students in the city’s public schools create peace tiles each year to place around the terra-cotta statue of Peace Pilgrim that stands near a grove of trees behind the municipal building. In September, eighth graders at the Egg Harbor City Community School and the Mullica Township Middle School will participate in a “Hands Across the Border” project that will advance understanding, tolerance and acceptance as they progress to their high school years at the regional Cedar Creek High School located here. “Peace Pilgrim taught us that peace is possible when every man, woman and child finds peace within themselves,” Reynolds said. The celebration includes a mass yoga and meditation event Friday evening, a 2-mile walk for peace Saturday morning, an old-fashioned, potluck picnic and drum circle Saturday afternoon, and an interfaith spiritual service on Sunday morning. 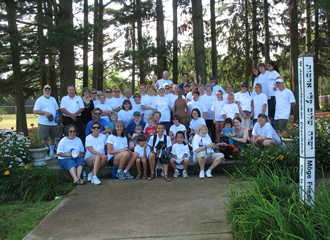 Details about the intergenerational events can be found at www.peacepilgrim100.com. The resolution will be forwarded to the International Cities of Peace organization in Dayton, Ohio for consideration. When Egg Harbor City is accepted, it will join other great cities, towns and villages around the world that are part of the peace network. Reynolds noted that goals for Egg Harbor City of Peace could include installation of a permanent labyrinth in Peace Pilgrim Park, or establishing a Peace Pilgrim museum within the city. Mr. Dickinson is a Councilman for Egg Harbor City, New Jersey. Doug was born and raised in Ithaca, New York. He got married while in college at 20 and was involved in Peace Movement during late 60’s early 70’s. His wife and he, as he recalled, had neither the pot or the window so he left school and learned how to be a cabinetmaker in the boating industry. In 1991, the economy was struggling and Doug was laid-off. A year later he was hired by Wawa Food Markets as a manager, stayed with that company for 12 years then became a deli manager in a grocery store until he retired in 2012. After his wife’s passing, Doug became very active in Egg Harbor City serving as a councilman for nine years and getting re-elected this past November. He is the past Master and past Secretary of the local Masonic Lodge. He served the New Jersey Grand Lodge as a Grand Chaplain in 1983-84. He is also the past Patron of our Eastern Star Chapter numerous times and served New Jersey Grand Chapter as their Grand Patron in 1992-93. Doug is a member of Egg Harbor City Kiwanis and our Historical Society as well as a member of local Knights of Columbus. Serving for 10 years on Stockton State College Board of Performing Arts, Doug was a past member of the Planning Board. His partner and he are active with South Jersey Coalition for peace and Justice. They table at various events and attend peace rallies in Washington and Philadelphia. They support local Veterans for Peace group. Doug is also very active with the local Peace Pilgrim committee. Two years ago he was the guest speaker at a Memorial Day Celebration, the topic being Peace. 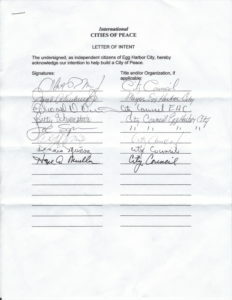 Egg Harbor City incorporated as a city by an Act of the New Jersey Legislature on June 14, 1858, from portions of Galloway Township and Mullica Township. The city was reincorporated on February 13, 1868. As of the 2010 United States Census, the city population was 4,243. The City was founded in 1854 by German Americans from Philadelphia as a refuge for those being persecuted in the anti-immigrant violence known as the Know-Nothing movement. It remained an island of German language and culture in South Jersey for more than 50 years.